Here, 10 delicious ice creams to make this summer. In this week’s episode of Mad Genius Tips, F&W’s Justin Chapple proves that you don’t need special equipment to make ice cream at home. In the video, Chapple freezes classic vanilla but the method will work with any flavor. Here, 10 delicious batches to make this summer. 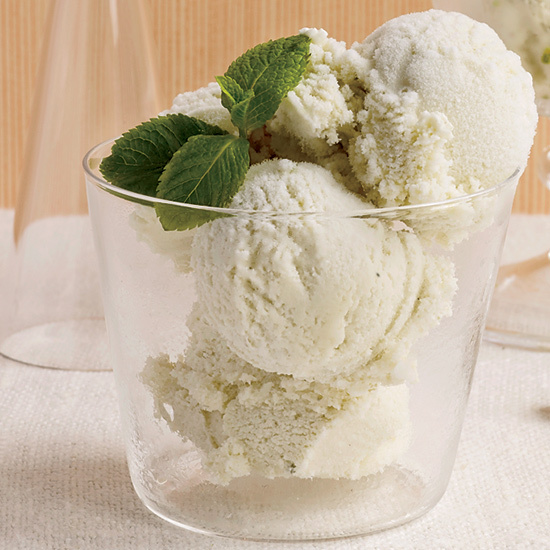 This exceptionally creamy ice cream is made with fresh mint and cream cheese. For a double dose of nuttiness, this ice cream includes both toasted pistachios and almond extract. This ice cream is so fabulously rich, you should probably have it only once every year. Made with bourbon and seasonal peaches, this is the perfect summer ice cream. This ice cream has a strong, malty flavor. There are just four ingredients in this simple ice cream: hazelnuts, half-and-half, sugar and egg yolks. Condensed milk and egg yolks enrich this take on the classic Vietnamese drink. A mere quarter cup of Riesling gives a lovely flavor to this very rich ice cream. Coconut milk replaces dairy in this super flavorful dessert. Sweet Italian red wines like Moscato Rosa and Sagrantino Passito give ice cream an intriguing berry flavor.